Class Description | Tuesday: Wild Heart’s Tuesday Company class is for advanced/professional movers. 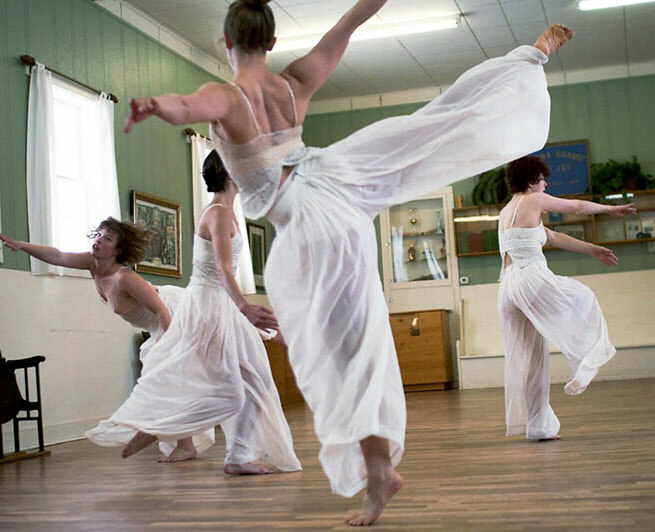 This contemporary class explores a more animalistic and energetic approach to dance. It is highly physical, challenging long held levels of comfort and understanding to awaken undiscovered capacities with each dancer. It uses more traditional modern dance modalities as well as more contemporary and improvisational structures to awaken the animal body. It uses a strong rhythmical base as well as a play between raw power and release to get each dancer invested in not only individual experience but also the generosity necessary for connection to one another. Class Description | Thursday: hosts a series of diverse teachers offering a wide range of styles that strengthen, challenge and delight the advanced and professional dancer. Check out our amazing teachers and class schedule. Class Description | Friday: These classes approach dance technique functionally, focusing on cleaning fundamental coordinations and attaining movement facility and ease through exercises that balance control and propulsion with release and momentum. Anatomical information about hard and soft structures inform the practice. The class builds from a gentle, introspective warm-up to challenging phrasework demanding fierce athleticism and refined artistry. Bio: Patrick Mueller is a Lead Faculty member at Colorado Conservatory of Dance. He’s the founder and Artistic Director of Control Group Productions, a dance-theatre / total performance company based in Denver. Over the last five years he founded and directed two black box performance venues – work|space Denver and The Packing House Center for the Arts – where he presented other artists, directed Residency and Education programs, and created original works with Control Group. He has performed professionally with dance companies in Germany, Denmark, New York, San Francisco, and Denver, working primarily collaboratively on original pieces that cross boundaries between dance, theatre, and performance art. Over his career he has toured to a dozen countries on three continents, and extensively through out the Eastern United States. His teaching approach amalgamates experiences from many different movement and somatic practices, including Bartenieff Fundamentals, Alexander Technique, releasing techniques, traditional modern dance, yoga, kung fu, and Parkour.